2nd Annual Venous Disease Coalition Annual Meeting - APS Foundation of America, Inc. Surgeon General Announces Call to Action at VDC Meeting Members of the Venous Disease Coalition (VDC) and the Office of the Surgeon General came together at the VDC Annual Meeting in Washington D.C. on Monday, September 15th. General’s Call to Action for the Prevention of Deep Vein Thrombosis and Pulmonary Embolism,” which combined affect hundreds of thousands of Americans each year. 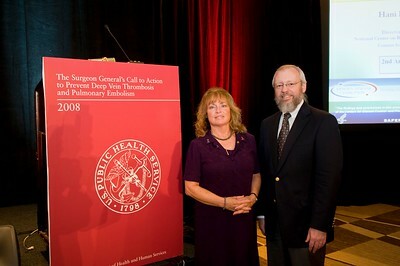 Dr. Gale McCarty & Dr. Tom Ortel represented the APSFA at this annual meeting.